In the midst of Buenos Aires’ most extreme heatwaves, a group of Red Cross volunteers walks through the narrow alleys of Barrio Mitre, one of the poorest neighbourhoods of Argentina’s capital city. In this small enclave, nestled in the thriving Saavedra district and just two blocks away from an upscale shopping mall, Julia and Aristóbulo Picón welcome two volunteers who have come to check the couple’s blood pressure. “But then these nice girls wouldn’t visit you every Saturday,” his wife teases. Like Julia and Aristóbulo, many residents of Barrio Mitre are not natives of Buenos Aires. Originally built during the 1950s as a provisional home for a group of neighbours who lost their houses in a fire, Barrio Mitre was never considered an official neighbourhood of the city. Over the years, while surrounding neighbourhoods grew more prosperous, residents of Barrio Mitre were increasingly marginalized. Meanwhile, its population — many from rural areas and other Latin American countries — kept growing. 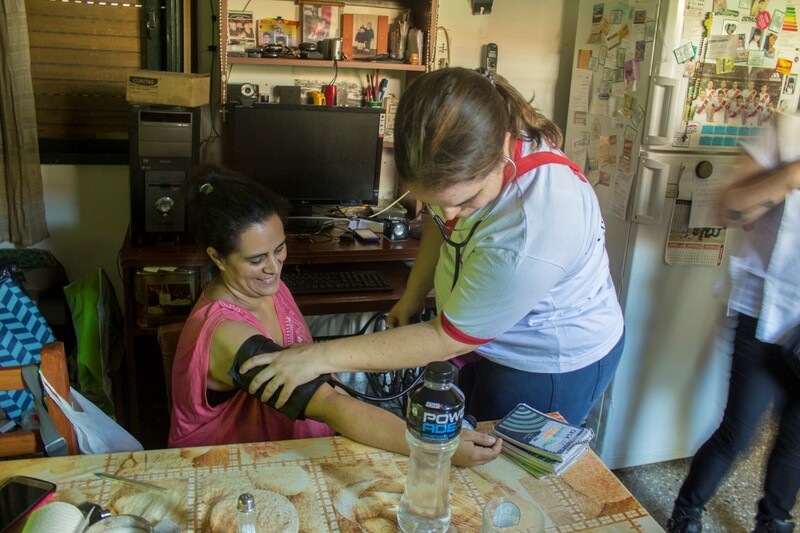 As the area’s needs increased, the Argentine Red Cross stepped in to provide basic health services and to work to reduce risks that disproportionately hit the city’s poorest. The volunteers’ work started some seven years ago but it increased dramatically after a pivotal event in 2013. On 2 April, after heavy rains, the homes of nearly all of Barrio Mitre’s 4,000 residents were completely inundated. The real goal, however, is not just to respond with aid in cases of emergency, but to help the community prepare itself more effectively. “What we want to achieve is resilience so that they themselves are better prepared to face emergencies,” says Gómez. In neighbourhoods such as Barrio Mitre, that means starting with the basics, things that most residents of Buenos Aires would take for granted, such as street signs. In one recent initiative, the Argentine Red Cross worked with locals to post street signs at every corner in order to allow people, including emergency personnel, to navigate Barrio Mitre without getting lost. Maria Agustina Larrea is an editor and freelance journalist based in Buenos Aires. The floods of 2013 in Barrio Mitre revealed the dire situation of all those living in the villas miserias or shanty towns in Buenos Aires: in a city where 3million people live in the downtown metro area (and roughly 9 million in surrounding areas known as ‘Greater Buenos Aires’), up to 400,000 people live in substandard housing, without access to public services such as electricity, sewage systems or natural gas. In addition, residents contend with a raft of social issues, from violence, drug addiction and human trafficking to unemployment, overcrowding, xenophobia and poor access to both health and education systems. This image of sprawling shanty towns and makeshift houses huddled in the shadow of lofty, glittering high-rises is an increasingly familiar sight in cities across Latin America as more and more people migrate to regional urban centres to escape drought or violence, or simply to find a job. Some 4.6 per cent of Argentina’s population — roughly 2 million people — are foreigners, according to a 2015 study issued by the United Nations. The latest national census, meanwhile, reports that up to 13.2 per cent of those living in Buenos Aires are immigrants (mainly from Bolivia, Paraguay and Peru), many of whom enter the country illegally and therefore end up without access to essential services. While much of the global media coverage of migration focuses on northerly migration, there is “a long-term history of internal immigration within the [South American] continent” and a considerable amount of migration to and within the Southern Cone, says Alexandre Claudon de Vernisy, head of Country Cluster Support representing Argentina, Brazil, Chile, Paraguay and Uruguay for the IFRC. Many of these migrants live without proper legal documentation in their adopted cities, without access to traditional pathways to education, employment or other government services. Many Latin American National Societies, such as the Argentine Red Cross, make particular efforts to reach out to these migrants, many of whom move to neighbourhoods already falling through the cracks of rampant urbanization. The Argentine Red Cross has identified nine such urban communities where it works on a range of issues, from routine health screenings to reducing stigmas around issues such as HIV/AIDS and providing first aid. It also works alongside communities to increase their ability to deal with crisis, providing some basic emergency equipment, helping them map their communities and develop evacuation plans and even training people how to carry injured people to places that are accessible to ambulances. One overarching goal is to develop a constant presence by building a local volunteer base and gaining acceptance by working with a range of local organizations, from communal dining rooms to churches, temples, schools, assistance centres, government agencies and even gang members. As a neutral auxiliary to the government, the National Society works under an agreement with authorities that allows it to offer services to help migrants access available services and integrate into city life. In Villa Fraga, one of the newest and most populated villas miserias in the heart of Buenos Aires, nearly 5,000 people live on a piece of land belonging to the national train system, near the railways. Divided in nine sectors, and considered by experts as one of the most hazardous shanty towns of the capital due to fights between immigrant gangs from different countries, there is only one way in or out of Villa Fraga. 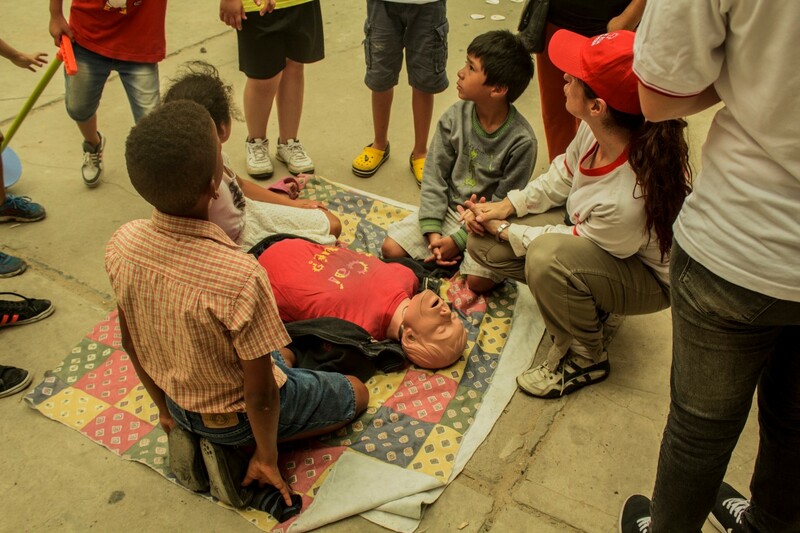 Red Cross volunteers are making inroads here by offering educational activities for children: for example, games aimed at helping them prevent domestic accidents or learn how to prevent diseases such as dengue and Zika. Precarious houses, with makeshift repairs, rise alongside the small muddy paths. On Sundays in the summer, most of the neighbours sit outside, trying to deal with suffocating temperatures that reach up to 38º Celsius. One local resident, Luisa, sits at the side of a modest cement football court and watches a group of 20 children paint, guided by Red Cross volunteers, while other youngsters study posters with information about diseases. “It’s amazing how concentrated they are right now,” says Luisa pointing at another group of children who are listening to a volunteer explain cardiopulmonary resuscitation. Due to her strong personality, Luisa has become a representative for Villa Fraga and her neighbours look for her when they have problems. On many occasions she has met with city authorities to negotiate better living conditions for the neighbourhood. Like many of her neighbours, Luisa came to Argentina from Peru to complete her studies. She wanted to be a nurse, but it didn’t work out. Now she works as a cleaner at a gym and is also an associate of a cooperative of city scavengers that collects recyclables in different neighbourhoods.